Not so long ago, external partners were responsible for maintaining the outdoor areas belonging to our real estate portfolio. Today, Vonovia is increasingly assuming responsibility for these areas itself. And that’s not all. 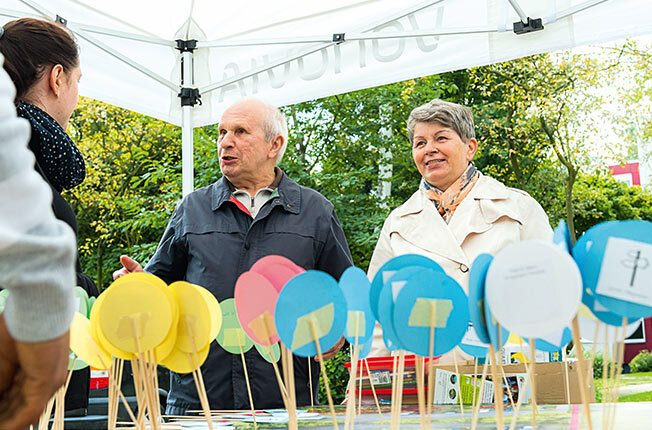 In consultation with municipal authorities and tenants, Vonovia’s residential environment organization is also putting a large number of new ideas into practice to make its neighborhoods even more appealing. “Testing workshop” for outdoor furniture, which employees of the Residential Environment Services department can try out, rate and select. 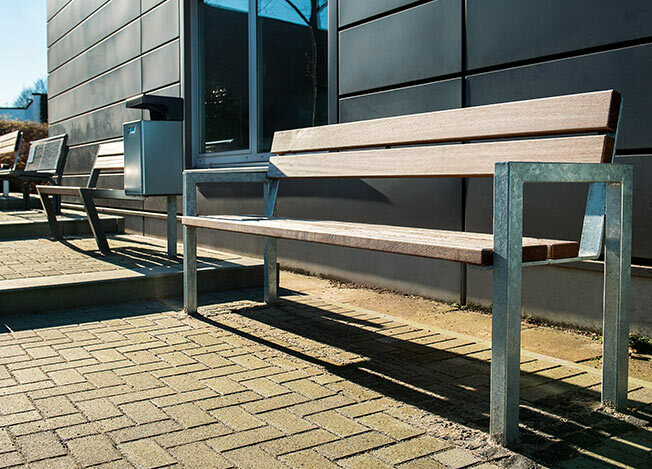 The right height is essential for sitting comfortably, even for park benches. When you start talking to Torsten Kirberger and Ullrich Pinick about the opportunities and challenges associated with residential environment development, you will soon realize that the discussion could well take more time than you bargained for. After all, the two project managers working within Vonovia’s relatively new Residential Environment Service department are certainly not short of ideas. 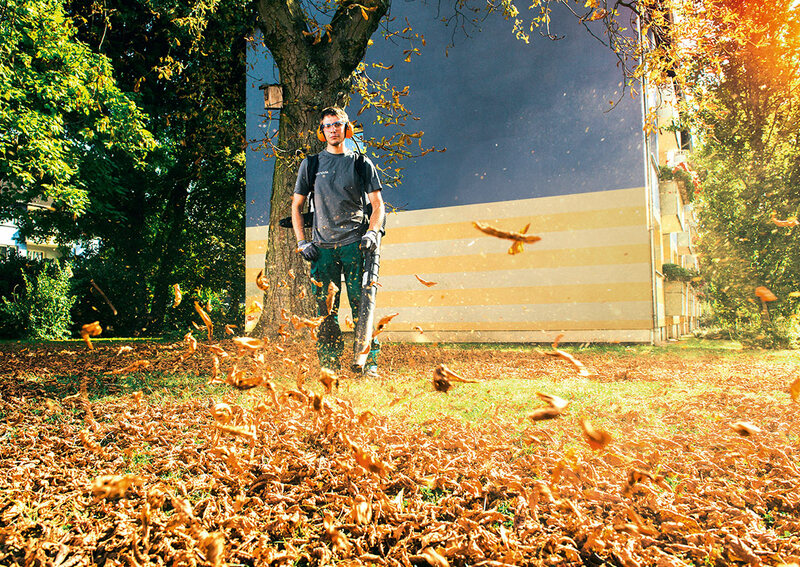 Torsten Kirberger: “Although our area of responsibility only forms a small part of the company as a whole, it has a huge emotional impact on customer satisfaction.” The decision to fell just one old tree can soon sour the mood of some inhabitants. Vice versa, a new park bench in the right location is enough to win friends for life. 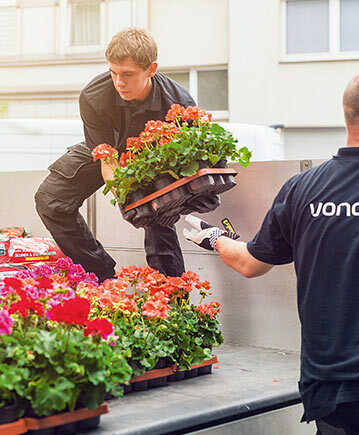 With the support of two partner companies for grounds maintenance, Vonovia’s residential environment organization currently manages outdoor areas spanning a vast area of almost 40 million square meters across Germany. This is the size of 5,400 soccer fields. 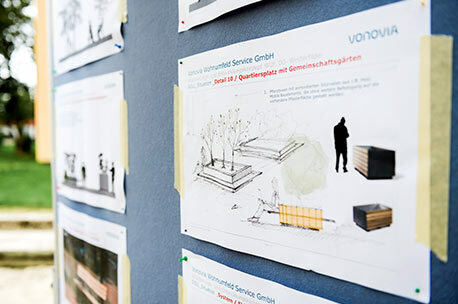 Vonovia’s in-house team now boasts more than 600 employees: Gardeners, pavers and landscape architects – together, they make sure that the outdoor areas and facilities are maintained or systematically upgraded. And the plan is to expand the team even further across the board: After all, there isn’t just a lot to be done – the company also has a lot of new ideas that it wants to implement. Vonovia has also made the decision to focus more on new construction, meaning that the residential environment team will be responsible for even more large-scale gardening and landscaping projects in the future. The bigger the contiguous groups of buildings that Vonovia has in a certain area, the more it pays to focus on the residential environment from the perspective of the neighborhood as a whole. This is precisely what Vonovia did three years ago in the Eltingviertel district in Essen. Within a short amount of time, the district in the North of the city was turned into a flagship project for successful neighborhood development. Since then, numerous new projects with a similar focus have been launched in various locations. They all share a common objective: to boost the feel-good factor for Vonovia’s tenants by improving the quality of the residential environment. It goes without saying that this is ultimately of economic benefit to Vonovia as well. It has been proven that an accepted residential environment also translates into lower property management costs, e. g. because there is less waste to clear up and less vandalism. Nevertheless, there are a few critical questions worth asking: Are the costs involved appropriate in relation to the benefits? And is the topic of neighborhood management compatible with Vonovia’s business approach at all? Neighborhoods are individual and shaped by regional characteristics, while Vonovia’s strength lies in standardization. Dortmund-Nette. Vonovia gives out flowers to its customers at the annual flower festival; thus, nothing stands in the way of springtime balconies. of lawn is tended to by our residential environment organization. can be viewed by our tenants from their apartments. Each neighborhood development project has its own special features, which means that there is no one-size-fits-all approach. This applies first and foremost as far as “interests and stakeholders” are concerned. Nevertheless, Vonovia can put the strengths of its business approach to good use in this respect too. The most important aspect when embarking on a neighborhood project is an in-depth status assessment performed by Vonovia’s project managers. This process involves collecting key data and holding extensive talks with local institutions. It also involves identifying and analyzing the expectations of the various stakeholders, such as tenants. Kirberger explains: “Stakeholder involvement is the name of the game when it comes to executing successful neighborhood projects. This is why we seek dialogue with relevant local groups very early on. These not only include the municipalities, but also – and most importantly – the tenants. We use tenant surveys to gather information on what they think.” At this stage in the process, the project managers prefer to call upon the support of neutral bodies such as Dresdner Projektschmiede, a polling organization that specializes in tenant surveys, or local neighborhood institutions that tend already to enjoy the trust of local tenants. Dortmund-Westerfilde. At a cooperation workshop, tenants can also share their ideas on shaping their residential environment. While this approach might be a time-consuming one, the hard work pays off, because it allows the project managers to launch the tenant consultation process well prepared. During these talks, adopting the right approach to certain topics can allow the project managers to build trust so that they can work with the individuals involved to identify the right common course of action. 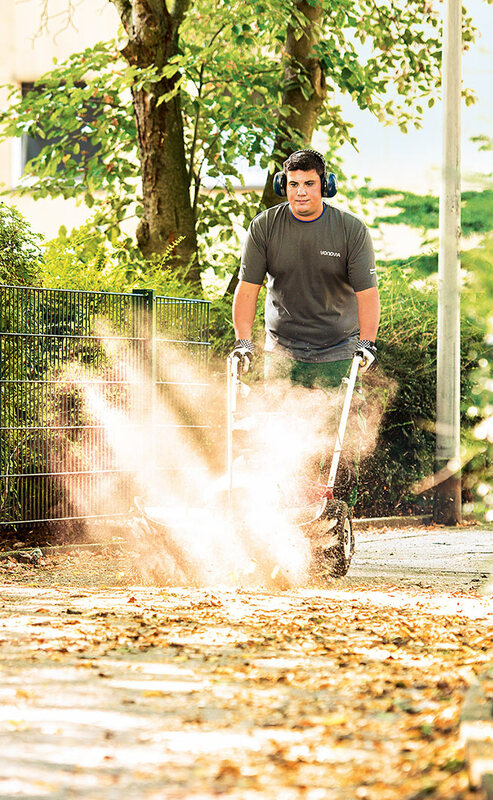 A recent example involves a project in Dortmund-Westerfilde, where outdoor areas were upgraded, play areas designed, and building entrances made fully accessible with the support of the city authorities and a combination of state and federal government funds. Neighborhood development projects are now very likely to be granted public-sector subsidies thanks to a large number of federal and state initiatives to promote the establishment and expansion of green spaces within cities. As a result, checking the subsidies available is just as much part of the project routine as tenant involvement. Dortmund-Westerfilde. The development concept contains a shared space with seating options and tenant gardens. 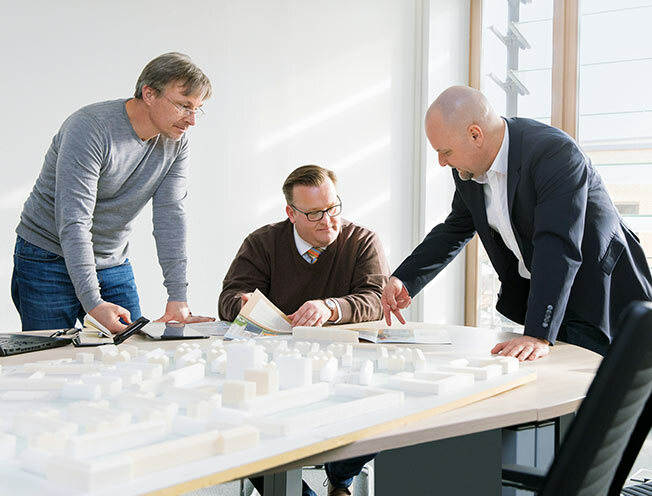 Torsten Kirberger (l) and Ullrich Pinick (r) (Vonovia Residential Environment Service) plan the residential environment of a Vonovia property in Berlin with Sebastian Krüger (center) (Regional Manager Berlin). Once again, Vonovia’s scaling strategy is immediately evident. Pinick: “We buy 4,000 bicycle stands from a manufacturer as opposed to 400. This has a clear impact on the price. The same applies to other things such as paving stones, fences and plants.” Another reason why neighborhood development projects can benefit from the cost advantages is that Vonovia can achieve more than its peers with the same amount of money. In addition, a smaller number of suppliers and defined product standards result in shorter delivery periods, improved planning reliability, and, as a result, faster implementation. In order to make sure that the outdoor areas are kept in good condition, they are inspected by caretakers on a weekly basis. This is another area in which Vonovia’s strengths come to the fore: If a caretaker identifies a defect, he immediately passes the information on to the residential environment organization using his iPad, where the report is handled. Defects reported by tenants are routed to Vonovia customer service. There, a ticket is created and commissioned directly to the residential environment organization. Public safety checks on trees, playgrounds and outside areas are also conducted as a matter of routine and in line with statutory requirements. A geographic information system (GIS) that is constantly updated is used to provide technical support to the Residential Environment Service department in its work. It provides all of the responsible employees within the Group and the external service providers with all the relevant qualitative and quantitative data on the outdoor areas – from meadows, shrubs and trees to lawns, playgrounds and the areas to be cleaned or cleared of snow and ice. Even the small residents are taken care of: Vonovia has over 5,000 playgrounds in its portfolio. 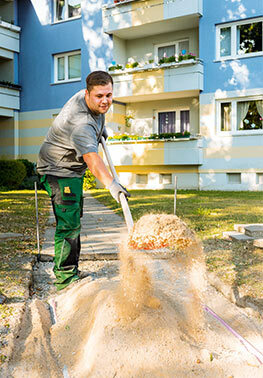 is the amount of outdoor area (private and public sidewalks) we sweep and clean. is the amount of outdoor area we shovel and grit. Vonovia has since made a name for itself on the basis of its strengths and expertise in the field of residential environment development. The City of Hamburg, for example, recently approached the company asking for its support with the organization of tenant workshops and the consultation process as part of an open space planning competition in the traditionally underprivileged district of Hamburg-Steilshoop. And on the other side of the Elbe River, in Hamburg-Wilhelmsburg, the city authorities and Vonovia have joined forces to think about how to achieve a more diverse resident structure, using vertical expansion, densification, and new construction measures, but also with the help of creative residential environment concepts. The residential environment organization is growing: Over 590 employees already work in this Vonovia department. Given just how much the core Residential Environment Services team at Vonovia achieves, it has a very streamlined structure. Or a very efficient structure, as Vonovia likes to describe it. At present, the more than 100 medium-sized and large-scale projects the department is currently working on are being tackled by ten open space planners and project managers, including Kirberger and Pinick. This approach works thanks to the particularly strong spirit of cooperation between the individuals involved and the very close collaboration with regional managers, real estate managers, and local partners. The fact that the landscape architects, planners, and project managers constantly provide each other with feedback also proves to be a huge advantage – and one that is probably unique in this form: This feedback keeps the need for the sort of unpopular extra work that can make a project so much more expensive to a minimum. And what’s next on the agenda? 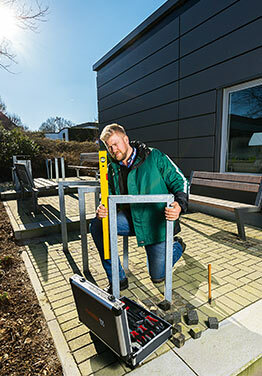 The duties assigned to Torsten Kirberger and Ullrich Pinick, who are both responsible for landscaping, remain varied and keep them constantly on the move. In Bielefeld-Sennestadt, for example, they are currently working with the regional management team on relocating walkways so that they lead straight to the buildings. This will allow pedestrians to avoid the neglected green spaces (= garbage traps), which are generally difficult to maintain, and will also serve to cut costs. There are also plans to improve the parking situation and to implement a state-of-the-art mobility concept featuring car-pooling spaces and electric charging stations for cars and bicycles. These measures will satisfy customer needs and create structural advantages. The project is to be rounded off by the remodeling of a neighborhood square. In Dortmund-Westerfilde, the plans developed together with the city authorities are still being completed: the team is currently looking into accessible garbage collection points as a small additional project. The current plans involve digging the garbage cans so deep into the ground that they can be used from a height of 1.10 meters, i. e. by a child or wheelchair user. This creates customer satisfaction. In Aachen-Preuswald, one project is focusing on the further development of a neighborhood square. The principle target groups are senior citizens and students. In order to be able to navigate the square at a leisurely pace, the senior citizens need places where they can stop to catch their breath every now and again. As the resting areas were removed at some point, the square needs a new set of benches. And the students? The best way to improve their quality of life nowadays is to offer a WiFi connection. Implementing this idea would be another new project for Vonovia. But this shouldn’t be a problem: after all, putting innovative ideas into practice is now part of Vonovia’s day-to-day business and will remain so for as long as this is beneficial to both its customers and Vonovia.